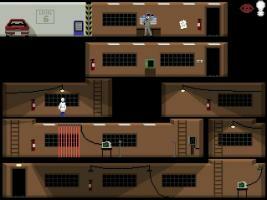 "An excellent arcade game, slightly hampered by odd difficulty spikes. Fine music, and multiple challenges, round off a solid package." Nothing much than a Splinter Cell clone. Good yes indeed no doubt, amazing...to..some. Great! i love 2d stealth games shame there arent many but this was great i didnt like the boss bit though and the mindwash scene is too hard still, a great game!! I keep playing and I find some stupid things around there. For instance there's always supposed to be a way to bypass cameras and guards, not only sneak through darkness, it's just... not right. A thief has possibilities. And what's with the zapping limit? Thought the game was too easy without it? Well, this is definitely a must-have :) There could be a little improvement in the graphics but this is just Yahtzee's style - Good :) Animations are smooth and detailed. There is a nice story in the background which doesn't pop in your eyes but keeps you wondering what's next. There are of course some things I cannot understand e.g. why when I cut a wire sometimes the cameras go off and sometimes the laser detectors? Play and enjoy the art of virtual theft (better virtual then real ;)). PS: A tip: at the beginning when you get your first points enable crouch-and-roll. It helps a lot in the next levels. Incredible game, Never thougth about finding a plataform game of this quality for AGS and for a lot of programming languajes. an Art-obre in programming, graphics and story. Remind me a little the Stealth-ingame of Sid Meier's Cover Ops. This is just a wonderful game. I usually don't like games that expect you to be very skillful, but this one did it for me. It was forgiving for someone like me by giving plenty of alarms and stuns. But it also keeps me coming back to improve on my previous bests. The visuals were good and the music really set the mood. The story was a nice addition and done well for such a game play oriented experience. A highly addictive game with its focus largely set on perfecting your patterns and actions that gives the game greatly improved depth. A major blast from the past! Great game! every aspect of the game is awesome! it took me hours of game to finish it and still i haven't collected all the trilby hats! Wow, just wow. Pulls you in right from the start with a great tutorial and then nonstop action that is easy enough for the breeze-through people and hard enough for those that want to go back and master each level. Great arcade gameplay, great powerups to grab along the way to make Trilby become just that more effective. There's NOTHING that could be done to make this game better, seriously. Awesome game!!! by a great Game Developer. Some one told me Yahtzee wasn't making any more games... i'm really glad they were wrong!! Love the game. It's hard, but addictive. Brilliant use of AGS, well done!